The name I chose for this blog, Bibio-filia, means “daughter of the library” in Latin. I really wanted Bibliophile, or Bibliophilia, but in these more crowded blogger days, you take what you can get. I’ve really warmed up to my second choice name, and decided to feature this passion for bricks and mortar libraries by profiling the libraries I explore. Last week was Spring Break for my sons and their schools, and our family headed for Florida. Our Florida beach of choice was in northern Florida, on Amelia Island, a vacation spot my husband had discovered years ago on a business conference. On Amelia, we found the lovely, very picturesque and well preserved Victorian town of Fernandina Beach. In the center of Fernandina Beach – where a library should be, in my opinion – was the unassuming Fernandina Beach Branch library, a library of the Nassau County, Florida Public Library System. The library was one large, open room, well lit with a high ceiling, with sections clearly labeled and easy to spot. The shelves were a bit too close to each other in the adult non-fiction section, which was a bit claustrophobic feeling. But this is a minor thing, I’d much rather a library packed things in a little tight rather than sacrifice volumes. There were plenty of catalog pcs, and internet browsing pcs, and a ton of local information and reference right at the entrance of the library. And racks of paperbacks! It’s been a long time since I saw these spinning racks. The children’s section had a small play/reading area that was in use while I was there, as were most collections. Plenty of patrons were browsing fiction, reading magazines, and using the pcs. I made sure that the library had one of my favorite volumes, Lewis Carroll’s Alice’s Adventures in Wonderland, and found they had a fairly new edition with illustrations by Robert Ingpen, published in 2009. The illustrations are just astounding, dreamy and colorful, with some new interpretations of the familiar scenes. I’m going to have to find myself a copy! When I arrived, a librarian was assisting a patron applying for a library card. When she finished, I asked permission to take some photos of the library for my blog, which was very graciously given after she checked with the head librarian. The librarian who assisted me was very friendly, answering my questions about the library. 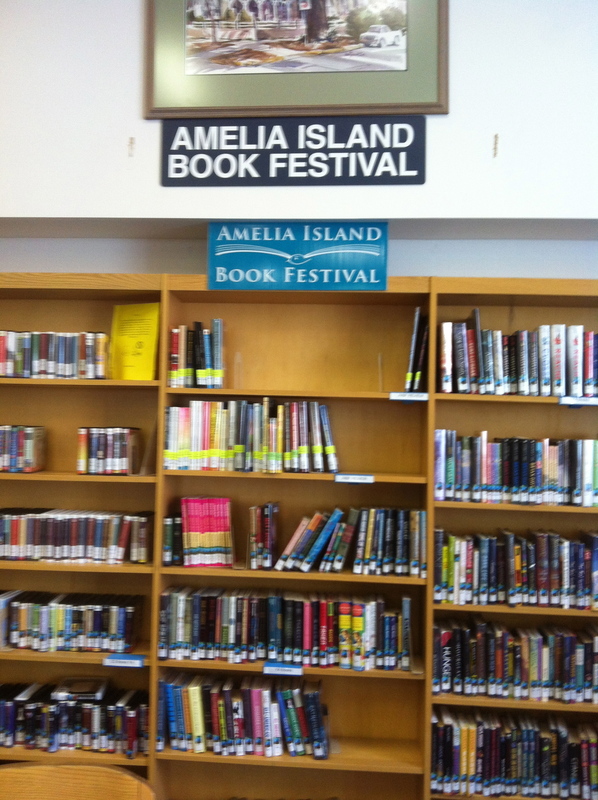 I was intrigued by the shelf that featured books from the Amelia Island Book Festival. A mix of bestsellers, niche, genre, and children’s books were on this shelf. The Book Festival appears to be a separate organization from the library system, but nicely supported by the library. I wish our visit had coincided with the Festival. I would have enjoyed attending some of the Festival events, and browsing the authors’ and publishers’ booths. If you are interested in the featured titles at the book fair, the festival maintains a page on Facebook that seems to list most of this year’s titles. The Nassau County Library system supports their libraries with a web site (http://www.nassaureads.com) that is both attractive and functional, and makes me realize just how inadequate the web presence of my home library system is. I love seeing the staff book choices on the site, and the quick links to local history and genealogy, plus calendars of events and programming. The links to downloadable ebooks and audiobooks are clear – something so simple that my library can’t seem to get sorted out. All in all, a very serviceable library with a friendly staff and an obvious enthusiasm for local interest and culture.